The previous article in the series detailing the 2019 Front Wing Regulations can be found by clicking here. As with the new incredibly detailed front wing rules, the FIA is seeking to clamp down on some of the aerodynamic freedom afforded to teams in the past - in this case where the brake air duct volume has not solely been used for the purposes of cooling the brakes but also contained winglets and guide vanes to manipulate the front wing, tyre, and suspension arm wakes for an aerodynamic advantage. 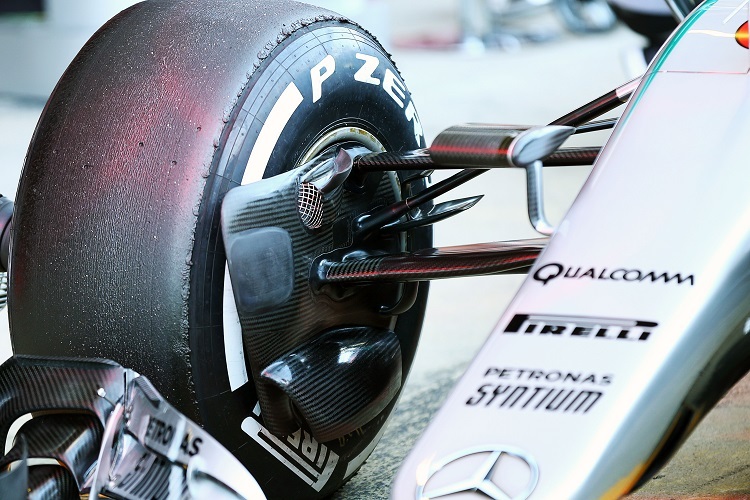 2016 Mercedes GP front brake duct and winglets [James Moy]. 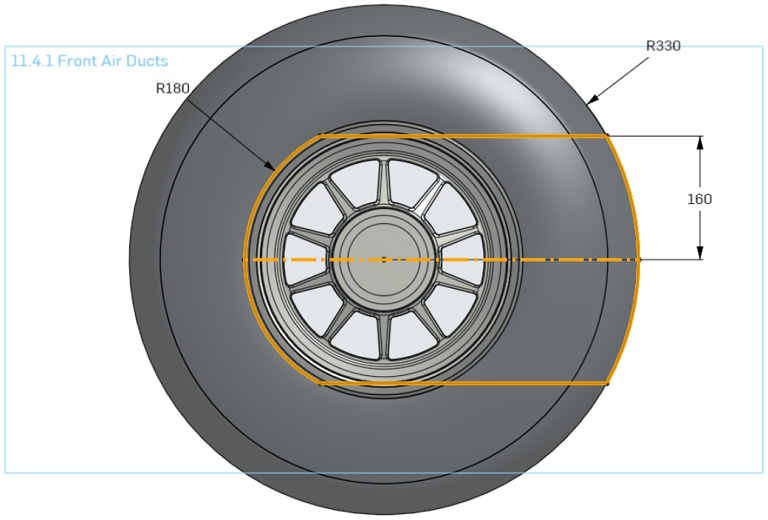 Previous to 2019 the air duct volume was bound by a volume which could extend forwards to meet a circular arc of 330mm radius, and rearwards to meet a circular arc of 180mm radius, and could extrude inwards by 120mm from the innermost face of the front wheel rim. Despite being listed as the “brake duct” volume there was no stipulation to prevent additional bodywork in this volume. The new brake duct must be contained within a circle with radius of 180mm. This means the air duct can no longer extend forwards to partially shroud the inner face of the front tyre as has been common since the early-2000’s. Comparison of 2018 and 2019 front brake duct volumes. 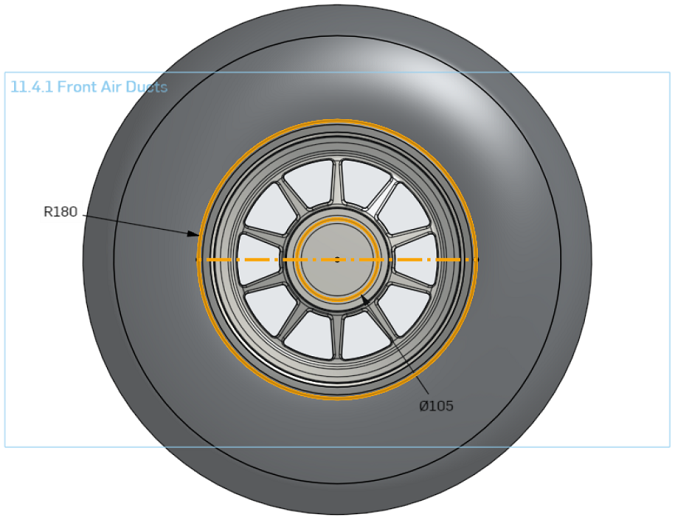 The thickness of the air duct volume remains 120mm from the inner face of the wheel rim, but it is unlikely the teams will use this full width for their air ducts in all but the most extreme of scenarios. Furthermore any bodywork protruding from the inner face of the wheel rim, by more than 5mm must form a single closed section, which cannot be taller than 180mm when viewed from the front. The bodywork within the brake duct volume can only contain a single aperture, which must be visible from the front of the car. Exceptions to this are apertures through the brake drum for the suspension arms, which must be sealed to prevent flow ingress into the brake drum. Comparison of 2018 (red) and 2019 (green) front brake air duct volumes. The FIA are also keen to clamp down on what is known as blowing of the front axle. 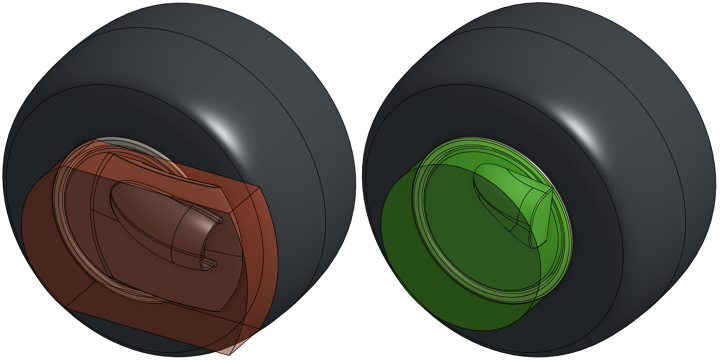 Blown axles use hollow wheel stubs, which are fed from a duct split from the brake duct, to blow air outboard of the car to manipulate the front wheel wake, helping prevent egress of low energy air to the underfloor. 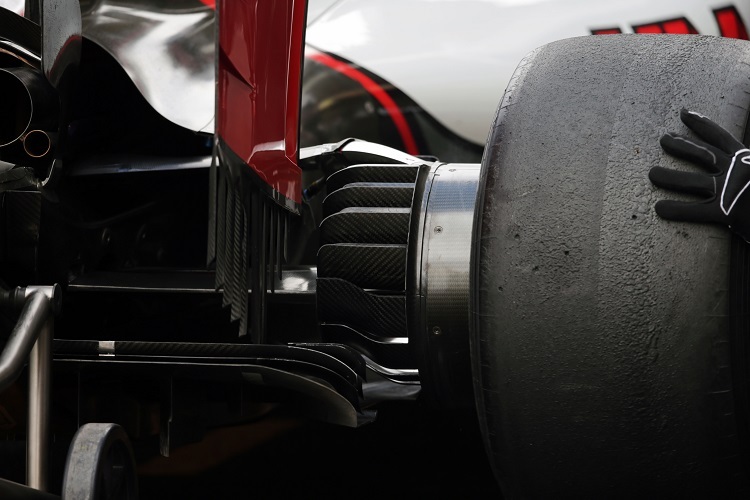 Similar to the cascades and aggressive turning vanes which are being banned on the front wing, the blown axle increases the effective width of the cars, making it more difficult to follow in the aerodynamic wake. 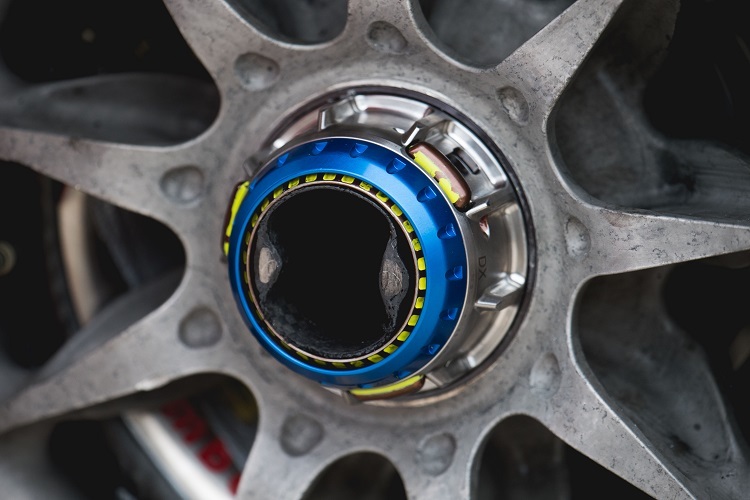 To clamp down on this teams are not permitted any air passing inside a circle 105mm in diameter, centred on the centre of rotation of the wheel. Blown wheel axle [James Moy]. Despite a late attempt by the FIA to apply similar restrictions to the rear brake ducts, the rear brake duct volume remains the same as in 2018 - meaning teams can continue to exploit the loophole allowing aerodynamic devices in the brake duct volume. At the rear this loophole is mostly used to create a set of stacked winglets, to produce upwash between the tyre and the edge of the rear diffuser. Haas F1 complex stacked winglets in rear brake duct volume [James Moy]. would be sufficient to prohibit any bodywork in the brake duct volume considered to have a secondary influence on the car, provided the FIA stewards actually enforced the intent of the rule during inspection of the cars. Whether these rules produce the desired increased in wheel-to-wheel action remains to be seen, but as ever it is most likely the teams with the greatest budgets will get closer to the optimal solution faster than the smaller teams.